Knorr-Bremse has worked with Hitachi on developing electronic braking systems for the new Class 800 operating on Great Western routes. Engineers based at Knorr-Bremse Rail UK’s Melksham facility say they are delighted with the braking performance of their systems developed for the new Hitachi Class 800 trainsets. The new trains entered passenger service on October 16th with Great Western Railway. Working closely with Hitachi Rail Europe, Knorr-Bremse developed, supplied and integrated the entire braking system for all the new Hitachi Class 800 series trains. This includes the electronic brake control system, the bogie equipment and the air supply system which uses the innovative and environmental friendly Knorr-Bremse oil-free compressor. The new Class 800 trains, built by Hitachi Rail Europe at their state of the art manufacturing facility in Newton Aycliffe, County Durham, are designed for intercity service at speeds of up to 200 km/h. 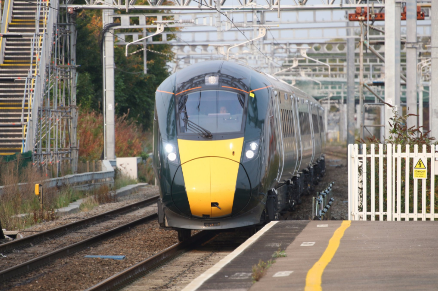 The new trains form the core of the Intercity Express Programme (IEP) and are initially replacing the current Intercity 125 fleet on the Great Western Main Line. The new trains will also replace those currently operating on long distance routes between London and Bristol, South Wales and towards the north and south Cotswolds. Following their initial introduction, the new trains will also enter service on the East Coast Main Line during 2018; serving routes to Aberdeen and Edinburgh. Earlier this year, at a ceremony in London, Knorr-Bremse was honoured by being presented with the Hitachi Rail Best Contribution to Value Generation Award for the supply and support of systems to Hitachi Rail for its global rail project applications. Knorr-Bremse Rail UK will also support its braking system through the life-cycle of the Class 800s, which is expected to be some 28 years, through its specialist Knorr-Bremse RailServices organisation. While operating  class 153, the unit stopped in 8 seconds from 20.4 mph on 1 in 92 falling gradient post free wheel. Better than class 800 of 1.2 m/s/s. Note class 153 no anti skid tread braked with bolt on sand system. What is going on here. Futher note mu wet steel on steel is .13.